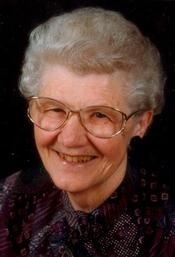 Elaine Christine Brenneman of Grace Village Retirement Community, 337 Grace Village Drive, Winona Lake, Indiana went home to be with her Lord and Savior on Sunday, January 27, 2013 at 1:05 a.m. surrounded by family at her daughter’s residence in Lewis Center, Ohio at the age of 88. She was a pastor’s wife and a homemaker, and a member of Winona Lake Grace Brethren Church. She has been a resident of Winona Lake, Indiana since 1978, moving here from Puerto Rico where she spent 19 years as a missionary and a lifetime in Christian ministry. Elaine was born on March 28, 1924 in Los Angeles, California to Leo Polman and Leila (Neher) Polman. She was married on October 3, 1952 to Maxwell Brenneman, who died on May 2, 1987. She will be lovingly remember by her daughters: Nancy Joyce (husband Don) Makeever (Bradenton, Florida); Ruth Elaine (husband Walter) Poupart (Lewis Center, Ohio); two grandsons: Joshua (wife Tirsa) Poupart, Joel (wife Jennifer) Poupart, and one granddaughter: Angela Christine Poupart. She also leaves behind three great grandchildren: Leo, Sammy, Caleb Poupart; and her sister, Joyce (husband D. Robert “Bob”) Griffith (Winona Lake, Indiana). She was preceded in death by her parents, husband, and her brother, Gerald Polman, and her great-grandson, Noah Poupart. Her funeral service will be conducted on Wednesday, January 30, 2013 at 5:30 p.m. at Redpath-Fruth Funeral Home, 225 Argonne Road, Warsaw, Indiana and officiated by Chaplain Bryan Benjamin and Pastor Bruce Barlow. There will be visitation prior to the service on Wednesday, January 30, 2013 from 3:30 – 5:30 p.m. at Redpath-Fruth Funeral Home. A private family graveside service will take place on Thursday, January 31, 2013 at Eberhart Lutheran Reform Church Cemetery, Columbia City, Indiana. Memorial donations in Elaine’s name may be directed to Grace Village Retirement Community, 337 Grace Village Drive, Winona Lake, Indiana 46590 and would be appreciated by her family.